........to know that music brings people together. Have you always wanted to sing but thought you were not good enough? 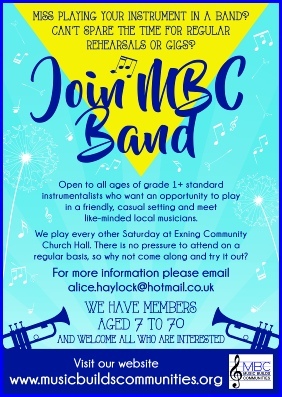 Have you ever played an instrument and would love to have a go again? and maybe play with others. Would you love to have opportunities to enjoy making music here in this area? Whether you can already sing or play or not we would love to hear from you. ...................is an opportunity to share music in this area. These previous activities are what people told us they would like in the past..
We are currently re-evaluating what we should provide and need your thoughts and ideas to help us decide. So please get in touch and share your ideas We look forward to hearing from you! with wide experience of instruments and a variety of music and singing genre. For those who can play an instrument and would enjoy the opportunity to play with others.